I don't know about you, but for me one of the worst places for healthy eating is often the office: the exact place where one SITS for literally 8 hours a day. 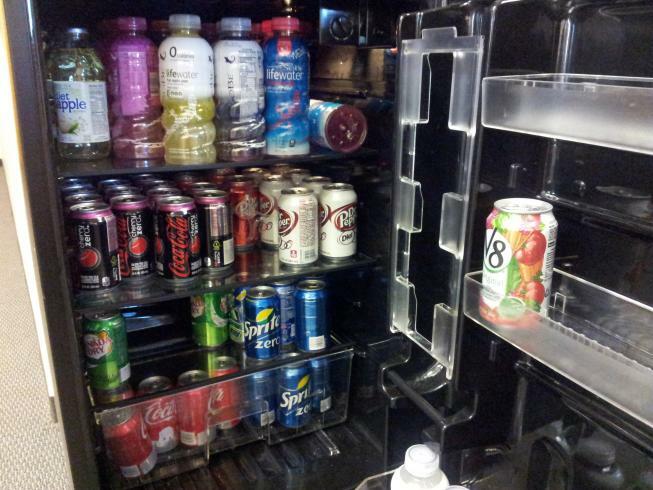 I guess it's often called a "perk"... free candy, free soda, free unhealthy snacks. But it really is a disservice. They're trying to kill me (or at least keep me fat!). Do you SEEEEEEEEEE this pile of Twix bars and Kit-Kats that I must walk by multiple times a day -------------------> I have willpower, and haven't had any candy. But, it's hard... really hard... to keep making the right choice day after day after day. I <3 Twix! Why must they torture me?!? Obviously. If people didn't like all these perks and the sodas sat around and the candy didn't get eaten, I'm sure the company would stop buying it. But people like eating convenient sugar-y stuff regardless of its toll on their health (and waistline!). 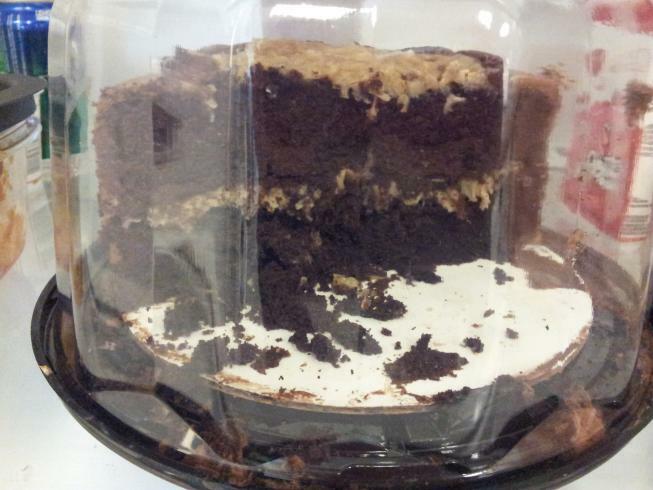 And leftover office birthday party German Chocolate Cake: (We've been sitting for 6 hours, let's celebrate with a giant piece of chocolate cake! YAY for calories!! YAY for fat!!) - lots of sarcasm. So now you see what temptations I deal with on a daily basis. Drink lots of water and hot tea. I usually will drink one unsweeteend iced tea or a Vitamin Water Zero (no artificial flavors/sweeteners) once a day. Pack my own snacks. I'll bring in my own snacks to the office. Veggies with hummus, cheese & a couple crackers, nuts, greek yogurt, etc. Remind myself often of my goals. Even if it's hourly... just reminding myself what I'm doing and why helps curb any temptations. Leave my desk at least once every hour. To refill my water, visit a coworker down the hall, or go to the restroom (Lord knows I go a lot with all that water drinking!!).. just being active that little bit helps. Share my excitement about a healthy lifestyle with others. Who knows, maybe one of these days none of my co-workers will enjoy candy, soda, and cake! (OK, not likely, but a girl can dream). 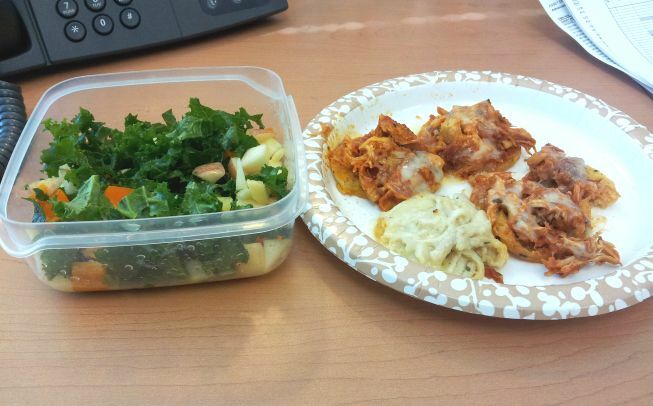 Oh, and for lunch yesterday I had leftover Citrus Kale Salad and leftover Italian Polenta. It was delicious... and the craziest part to me was that the salad was not wilty at all. 3 days later and it's still perfectly firm and crispy and yummy! No lettuce or spinach can do that! That makes this salad even MORE of a winner in my book!! 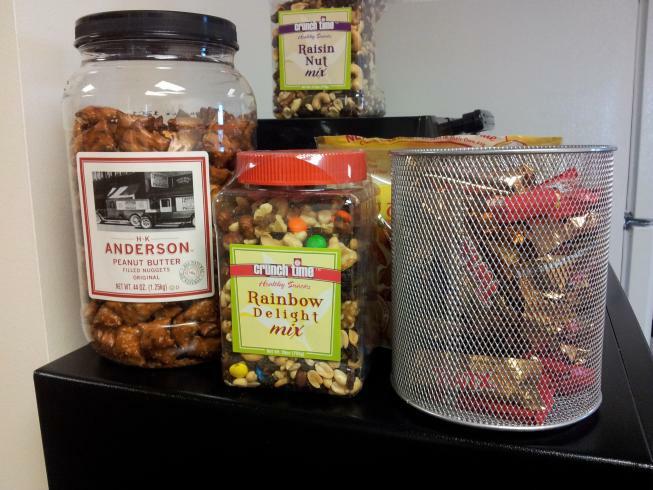 Do you find you struggle with "office snacks/perks" as well? What are you tempted by? Have you tried the Citrus Kale Salad yet?? No? WHY NOT?!?!?? ?